I have already seen there's a topic about Anastasia called Ana or not (and it was clear not). But i didn't find a topic about her reald pet name, i mean, the one used in family. If there's and i didn't find it, mods, feel free to move this topic! Having studied russian, and knowing how russian use pet names and nicknames, i'm always a bit surprised that in thei letters & diaries, NAOTMAA often called each other with full names. Knowing, moreover, how used were nicknames in european royal houses during Belle Epoque (Sasha, Minnie, Nicky, and from alix's side, Alicky, Vicky, Ella, Ernie, and so on! ), i always thought it was a bit uncommon. I have only once seen Anastasia called with one of russian petnames of her name: she herself calls her "Nastaska" (if i remind well) ina letter to Nicholas. (i'm not at home so i can't quote the letter from A lifelong Passion, sorry). my question is: do we have other examples of anastasia being called otherwise than her full name? ok, we know that Marija was called Mashka, or Masha, but i would need something for Anastasia now something real, i mean. Mmm i've just found it, "hidden" in thread about Tatiana! However, there are plenty of letters with the Little Pair's nicknames: Masha, Mashka, Nastasia, Nastaska, Nastya. Alexandra also used "Mashenka" for Maria twice in 1910. First of all, thank you sarah, you're the best for these things! So, i take Amastasia's pet names. But anyone know the letters in which they have been used? I know she went by Nastasya, because she signed that way in a letter once hope this helps! Many thanks to Laura Mabee for the banner!! "We played on the swing, that was when I roared with laughter, the fall was so wonderful! Indeed!" If you get a copy of Avgusteyshie Sestry Miloserdiya (Royal Sisters of Mercy) you'll find many examples of letters Anastasia signed with her pet names. However, when her family was writing *about* her, they almost always called her Anastasia -- except for Olga, who sometimes referred to her as Shvybs or Shvybzik. In Olga's 1913 diary I think she calls Anastasia Nastenka or something like that. I'll check to make sure but I don't think I'll be able to find it! AAAAHHH I WANT IT! It's still out of print. Ana is not a Russian diminutive for the name Anastasia. Anastasia signed her letters as Anastasia, Nastaska, Nastas, Nastasya, and Caspian Nastaska for the most part. 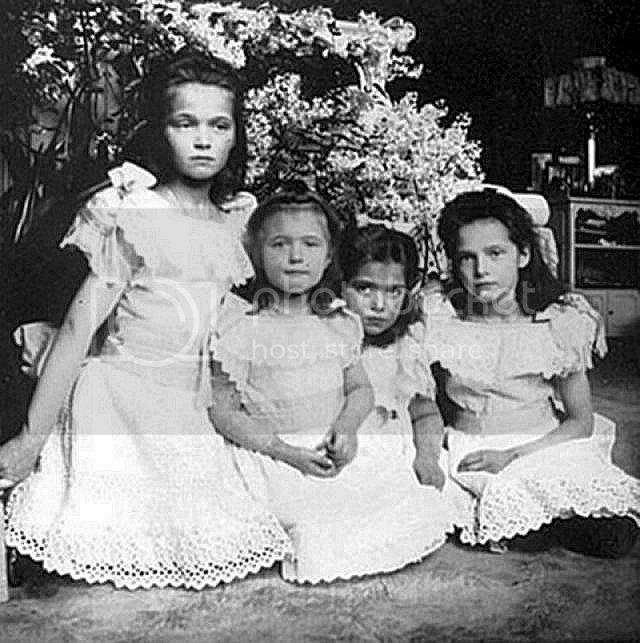 Olga referred to Anastasia as Shvybs or Shvybzik, as Sarushka pointed out, in letters referring to her. It always annoys me when people call her "Ana" or "Anya". And I think people like to shorten it because it's a fairly long name. Most people aren't knowledgeable on Russian diminutives unless they're Russian in heritage or study it. you're right. I've read russian litterature since infancy, so the use of pet names was clear to me. When i took my russian classes at college, the professor was surprised i knew the given name for every petname. None of my classmate knew even one. Yet in the thrd (last) year they had problems understanda that in the same text, Vanja and Ivan was the same person. So, even those who study russian don't know sometimes. As several people have brought up, Anastasia was also called Shvybzik by her older sisters, but I thought I'd bring up that Shvybzik roughly translates to "imp" or "little imp." But 'shivbzik' is not a Russian word. It was adapted from the German word for 'tipsy' by the Romanovs. I have no idea how it ended up being thought of as Russian for 'imp'. Maybe because all the court memories said she was a imp! writer_in_the_making : thanks, i knew it but thanks anyway, even if i specifically wanted to know the russian diminutives. It was Olga who used "Schwybzik" or "Schwibs" the most.